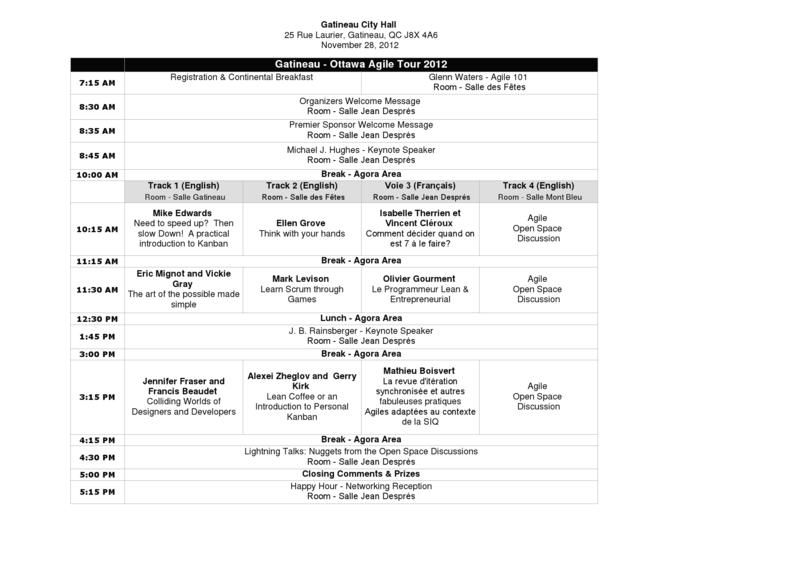 Welcome to the 1st Edition of the Gatineau / Ottawa Agile Tour! Agile practices are more popular than ever, driven by the need for businesses to deliver more with less in today's wavering economic environment. At the end of 2011, the Project Management Institute launched a new PMI-Agile Certified Practitioner (PMI-ACP) program. On April of this year, Steve Denning wrote in Forbes Magazine that Agile was the Best-Kept Management Secret on the Planet. The world is quickly becoming Agile and here’s your chance to prove that you are too! The local Agile Community is proud to finally bring the event to Gatineau / Ottawa for the 1st edition of the Agile Tour in the National Capital Region. A team of dedicated and experienced Agile practitioners are working together and committed in providing a high quality conference for the +200 professionals expected to attend. The full day event will take place on Wednesday November 28th, 2012 at the Gatineau City Hall (Maison du Citoyen) .